The grilles type ASL consist of a diffuser-type front border with horizontal, individually adjustable front blades and concealed screw fixing. They are also available on request with spring clip fixing. The type TRS-K consists of the front border with counter punched holes and individually adjustable vertical blades. 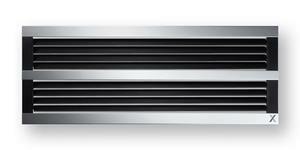 The new X-GRILLE Cover ventilation grilles made of high-quality aluminium combine function with an attractive design. They can be installed in walls, ceilings or rectangular ducts. Consisting of a front border with horizontal, individually adjustable front blades, for visible screw fixing (counter punched holes). These can also be supplied with concealed screw fixing on request. With perimeter angle border and opposed blade action, blades adjustable from the front. Non-vision grilles type AGS are suitable for air transfer and exhaust air. They consist of a surrounding front border with horizontal, fixed inverted vee blades and are suitable for visible screw fixing (border counter punched). The grille can be supplied on request with a matching rear frame for door installation (type AGS-T). The type TRS-R grille consists of an angled front border to match circular duct profiles, with counter punched holes and individually adjustable vertical blades. Consisting of a front border with vertical, individually adjustable front blades, for visible screw fixing (counter punched holes). Hit and miss control with air flow straightener and perimeter angle border.